Frank Spencer (MBA 1986) helped to build his first Habitat for Humanity house in 1988. It was in the Belmont neighborhood of Charlotte, North Carolina, and, like many Habitat homes, was constructed over approximately 10 weeks, with Spencer and other members of his church serving as the volunteer weekend work crew. "I remember being out there on the first day of framing," he says. "We went from slab to entirely completed walls in eight hours." In 2012, nearly 25 years after pounding nails and hanging drywall in that first house, Spencer became president and CEO of Habitat for Humanity Charlotte. "What I loved about Habitat then, and still love now, is that it's a tangible demonstration of how I believe God calls us to work in the world," he says. "Show up with an open heart and willing hands. You don't have to have the whole thing figured out or even know the details of the plan. You just have to be willing to participate with others in the work." "Real estate is the thread that's run through my career," adds Spencer, who most recently served as president of Cogdell Spencer Inc., a publicly traded health care, real estate investment trust. "Affordable housing in particular has been a longtime passion of mine." In addition to helping to develop the first SRO (single-room occupancy) residence for homeless men in Charlotte, Spencer has served on the board of the Charlotte Housing Authority Transitional Families Program, which became the national model for reform during the Clinton Administration. 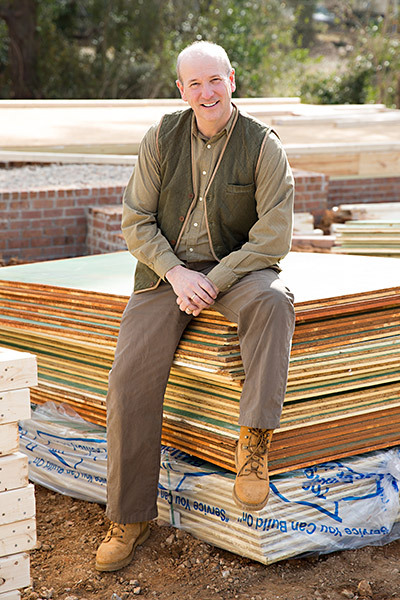 Since joining Habitat, Spencer has overseen a significant uptick in activity. In FY 2012, construction starts numbered 80; in the first four months of FY 2014, production is on pace for 125 annual starts—without a dramatic increase in personnel. "We had an incredible staff in place," he explains. "The team just needed a coach to get them organized to run the right plays." He cites HBS for providing that know-how, and more: "Do we need to be able to build a decision tree and create a net present value on a financial analysis? Absolutely," he says. "But I think one way that HBS has shaped me as a leader is by showing that the right technical answer might not do you much good at all if you can't also manage the very real people challenges." Spencer describes his other duties as a combination of financial management, fundraising, operational effectiveness, and strategic planning. "In that regard, the nonprofit and private-sector worlds are very similar," he says. "We talk about our work as a ministry, and it is—there are 5,000 people in Charlotte who live in homes that have been built or repaired by Habitat. And every year we have 5,000 volunteers who come from churches, synagogues, corporations, and service clubs to build and repair these houses. It's a ministry to both sides. But it is also a complex organization that demands planning for logistics, organizational issues, strategy, and capital." In addition to his full-time work at Habitat, Spencer devotes approximately 20 hours each week to prepping for and attending classes at Union Presbyterian Seminary, where he expects to complete a master's of divinity degree in 2014. "I didn't wake up one morning and say, 'I no longer want to be a public CEO; I think I want to be a preacher," he says. "The church has always been a part of how I've structured my life." Recently, that relationship became even stronger. After two years of setting Habitat on a new trajectory, the General Assembly of the Presbyterian Church (USA) will vote to confirm Spencer as President/CEO of the church's Board of Pensions in June. With roots dating back to 1717, 40,000 members, and approximately $9.1 billion of assets under management, it is one of the oldest benefit plans in the United States, providing ministers and teachers of the church with pensions, medical benefits, life and disability insurance, financial assistance, and mid-career education. Asked to consider his impact, Spencer says, "I know I haven't changed the whole, wide world. But I do think the things that I have chosen to devote my time and resources to have changed this community. Certainly it's made a difference to 5,000 of our Charlotte neighbors who woke up this morning in homes built or repaired by Habitat. And in my new role, I hope to make a difference by serving those who have served the church."